The machine is a specialist to cut the smallest pieces, whenever working with a regular circular saw is impossible and too dangerous. The high-performance 110 – 120-Volt motor is very quiet and has a prolonged life expectancy. Cutting depths: in wood up to 5/16 in. (8 mm), in plastic (also circuit boards) up to approx. (3 mm), in non-ferrous metals up to 1/16 in. Even fiberglass reinforced plastics can be cut with the carbide tipped saw blade (available as accessory). The machined and perfectly plane aluminum worktable in size 6 1/4 in. X 6 1/4 in. (160 x 160 mm) allows for sliding the work piece easily. The housing is made of sturdy plastic (ABS) with a side door to conveniently remove saw dust. With the included Super Cut Saw Blade 2 9/32 in. (58 mm) it is possible to cut soft wood up to 5/16 in. Other saw blades, available as accessories in our program, with 2 in. (50 mm), still ensure up to 15/64 in. (6 mm) cutting depth. X 7 5/8 in. X 3 11/64 in. (265 x 195 x 85 mm). Perfectly plane and sturdy worktable of die-cast aluminum. Sturdy plastic housing with side door for easy sawdust removal. Quiet, high performance 110-120-Volt motor for prolonged use. Not intended for industrial use. 5/6 in Product Depth in. : 10.83 Product Height in. : 4.92 Product Width in. : 8.66 Table Length in. : 6.25 Table Width in. 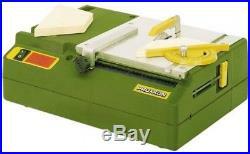 : 6.25 Amperage (amps): 0.77 Bench & Stationary Tool Type: Table Saw Bench or Stationary: Bench Blade Diameter in. : 2-9/32 Blade Location: Right Blade Speed: 8000 RPM Color Family: Green Condition: New Cord Length ft. : 7.4 Depth Control: No Dust Collection Method: 1.5 in. 0 in Maximum Speed (rpm): 8000.0 No Tool Blade Change: No Power Tool Features: Blade Guard System Product Weight lb. The item “Proxxon Bench Table Saw Carbide Tipped Blade Adjustable Longitudinal Fence” is in sale since Saturday, July 28, 2018. This item is in the category “Home & Garden\Tools\Power Tools\Saws & Blades\Corded Circular Saws”. The seller is “ship4unow” and is located in Huntington Beach, California. This item can be shipped to United States, Canada, United Kingdom, Denmark, Romania, Slovakia, Bulgaria, Czech republic, Finland, Hungary, Latvia, Lithuania, Malta, Estonia, Australia, Greece, Portugal, Cyprus, Slovenia, Japan, China, Sweden, South Korea, Indonesia, Taiwan, South africa, Thailand, Belgium, France, Hong Kong, Ireland, Netherlands, Poland, Spain, Italy, Germany, Austria, Israel, Mexico, New Zealand, Philippines, Singapore, Switzerland, Norway, Saudi arabia, Ukraine, United arab emirates, Qatar, Kuwait, Bahrain, Croatia, Malaysia, Brazil, Chile, Colombia, Costa rica, Dominican republic, Panama, Trinidad and tobago, Guatemala, El salvador, Honduras, Jamaica.